If there's one thing you learn in college, it's how to have a healthy disdain for the campus parking police. 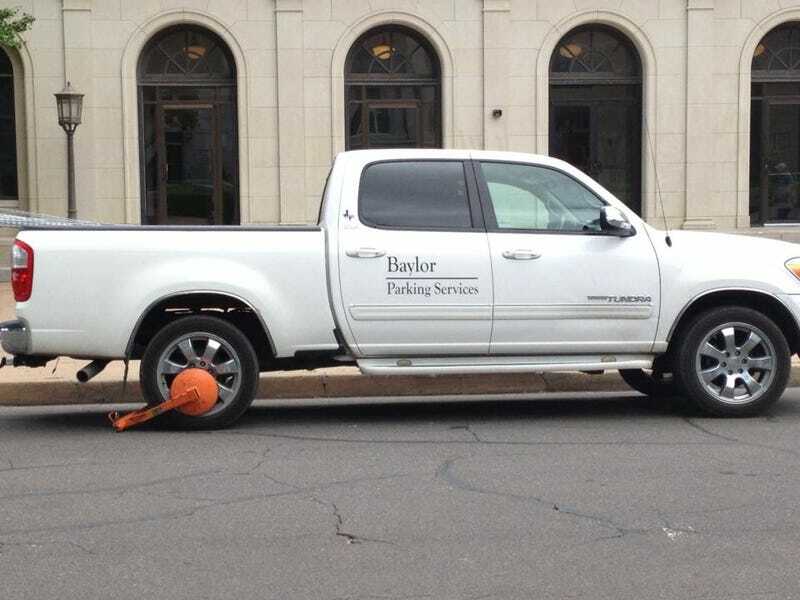 Whoever put this boot on the Baylor University Parking Services truck deserves a hug and box of kolaches. Sure, some of my parking tickets back in the day were warranted. Hey, man, my Grand Am fit on that sidewalk! Many times, dear collegiate Jalops, the deck is simply stacked against us. There are too few legal parking spaces where we need to be. It's 110 outside, the humidity makes it feel like you're inside Satan's jock strap and the university converted that lot into "green space" over the summer without giving us alternate spaces to park?! THE AGONY. Other times, the parking cops just hover like vultures, waiting for their next victim. Anyone who's ever dealt with any kind of equipment check-out knows the horrors of which I speak. Those spaces were usually limited to fifteen minutes of use, yet the actual check-out process was rarely that brief. Sometimes the professor you need to sign off on a project simply goes missing. I'm still convinced that there are black holes to a lonely alternate dimension somewhere between the parking lot outside Castellaw and professors' offices. Other times, you're stuck trying to fit four HD cameras, two light kits and enough extension cord to encircle Mars into the back end of someone's Fiat – all under the watchful eyes of the campus rent-a-cops. Even when you have everything as meticulously planned out as possible, there are myriad little things that can thwart your allotted fifteen-minute time frame: surprise sign-off requirements, finally finding the one person you need to ask about something in the hallway and most of all, missing batteries. So, for everyone who's given up on a legal parking space for lack of options, had a fifteen-minute equipment loading session last for forty-five minutes, or screw you, this is a park-in against the great injustices made against the student body – this song's for you.